Amazon has made an error in my royalty reports. What do I do? Two part question: 1. In my book, I have included links to YouTube Jazz recordings by jazz greats like Dizzie Gillepsie. Do I have permission to do that? and 2. If I want to copy a website address into a link, does that infringe on copyright? How do I make it easy for a bookstore to carry my book without bearing the financial burden of returns? How do I convert a PDF to a fixed layout ebook? When I launch my book, should I change my spelling to American English? 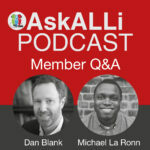 Thank you for your time and your tips, Michael and Dan! I’m currently on the Great Website Tour, visiting the websites of various author I admire and respect, seeing what they done that I like as a visitor and what I found confusing. (wry grin) I’m hoping to learn a lot from observation. I appreciated you boiling it down to key questions of what we want to accomplish with our pages, which is the whole point of having the website. 🙂 Once again, thank you!